Could your empty bedroom help with King County’s housing shortage? King County’s surging number of empty nesters — people over 50 living in homes with no children or extended family — adds up to lots of empty bedrooms. Could the estimated 200,000 bedrooms with no one sleeping in them help alleviate the county’s housing shortage? 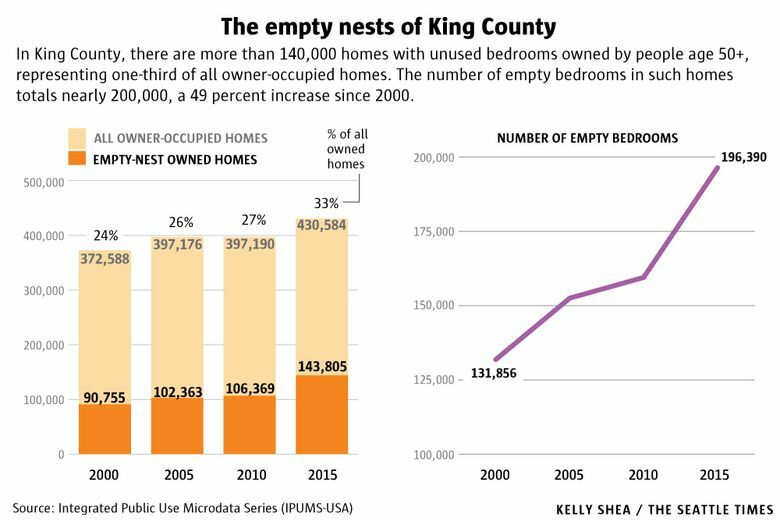 Ever wonder how many empty bedrooms there are in King County homes? Me, neither. But one Seattle Times reader did. On the one hand, he noted, there is a shortage of affordable housing in the Seattle area. On the other, there are lots of empty nesters, like himself, who could benefit from a little extra rental income. So I looked into it. Turns out, not only are we awash in empty-nest homes, but the number has spiked sharply in the past 15 years. Got a question for FYI Guy? If you have a question about the Seattle area or Washington that could be answered with data, send it to Gene Balk, gbalk@seattletimes.com. Using census data, I calculated the number of owner-occupied King County homes that are likely empty nests — that is, the homeowner is age 50 or older, there are no children or extended family currently living there, and the home has three or more bedrooms. 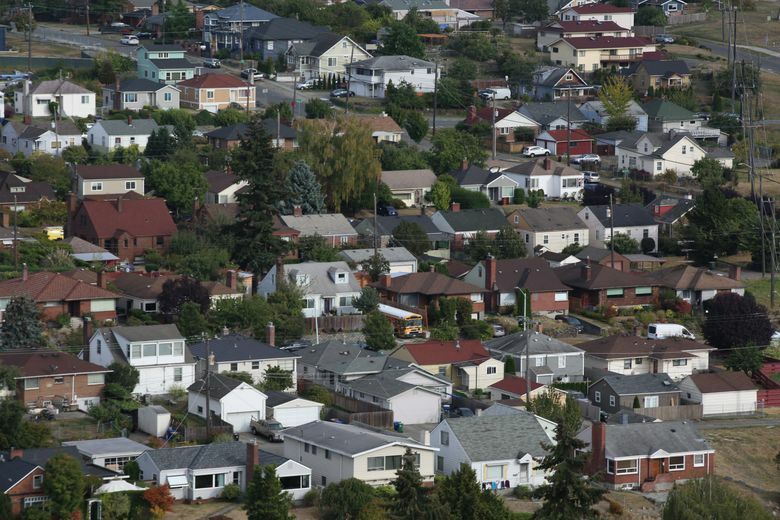 The total: 144,000 — that’s one-third of all the owner-occupied homes in the county. About 62 percent are owned by married couples; the rest have a single occupant. If you start counting at the third bedroom, these homes combined contain nearly 200,000 bedrooms with nobody sleeping in them. The number of such homes has increased by nearly 50 percent since 2000, when they made up less than one-quarter of owned homes in the county. The rise in empty-nest homes is a byproduct of the massive baby-boom generation, now aging into their 50s and 60s. As I reported recently, 100 percent of the growth in King County homeownership since 2005 has occurred among people 55 and older, who now represent nearly half of all homeowners. The irony of this glut of empty bedrooms in the midst of a housing shortage is not lost on Michael Geller, an architect and planner in Vancouver, B.C., where the housing situation is similar. Geller recently proposed this idea for Vancouver. While it hasn’t gained much traction there, he notes there’s been a lot of discussion around seniors in “under-occupied” homes in the U.K., where there is also a severe housing shortage. For people who live in public housing, the British government has imposed a “bedroom tax” on unused rooms. It is also considering steps to incentivize older people who own large homes to move out, thus making way for younger families. “In Vancouver, we take the opposite approach,” Geller said. “We make it easy for seniors to stay in their houses through a tax-deferral program.” Washington has similar tax-relief programs for lower-income senior homeowners. The idea of older homeowners taking in tenants already exists, to some degree. For example, people who own homes near universities sometimes rent out rooms to students. And more recently, homeowners are turning spare rooms into profit through Airbnb, which is used for short-term visitors. For some older homeowners, a longer-term tenant might be preferable. In addition to a stable source of income, a younger tenant might be able help out around the house. Taking in a boarder could also alleviate the social isolation felt by some seniors who live alone.